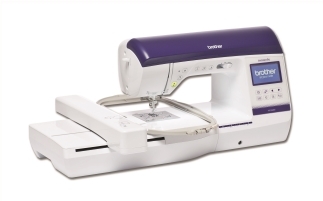 Open up an exciting world of both sewing and embroidery with the Brother Innov-IS 2600. This fabulous all-in-one machine features a fabulous selection of stitches and patterns together with highly advanced functionality. Professional sewing and embroidery are at your fingertips with this impressive machine. The Brother Innov-IS 2600 gives you an incredible 232 built-in stitches including 133 wonderful decorative options and 10 styles of one step automatic buttonhole. There are also 138 built-in embroidery patterns you can use to create beautiful embellishments. You can adjust your stitch length and stitch width and My Custom Stitch enables you to create your own stitches and save them to the machine’s memory. You have powerful editing facilities for your patterns and so you are able to re-size, rotate and mirror your designs plus much more. You have 11 different fonts for monogramming and a generous work area. Stitch, pattern selection and editing are easy via the LCD touchscreen and the automatic needle threader and quick set drop in bobbin mean that you are ready to start sewing in no time. You have a great view of your work with the LED lighting and speed control for handling intricate work. The Square Feed Drive System means that all of your fabrics will feed beautifully and the excellent stitch quality is always maintained. The Continuous Automatic Pressure System (ICAPS) detects the thickness of your fabric and makes the appropriate adjustments and you have sideways feed functionality too. The Brother Innov-IS 2600 is the complete sewing and embroidery machine and will deliver professional results time after time.